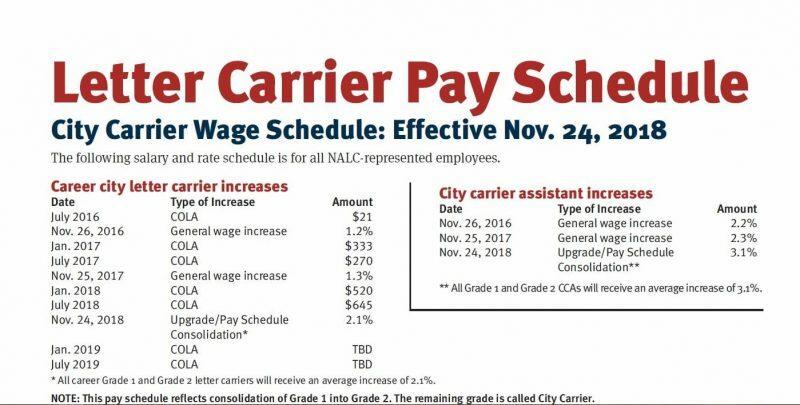 In accordance with the MOU Re: Pay Schedule Consolidation, all career and non-career (CCA) grade 1 city letter carriers will be upgraded to their equivalent step in grade 2 effective Nov. 24. Carrier technicians will receive an additional 2.1 percent compensation of their applicable hourly wage for all paid hours effective Nov. 24. Time served toward a letter carrier’s next step is maintained and each will receive their next step increase as previously scheduled. In accordance with Article 9, Section 7, CCA letter carriers will receive a 1.0 percent general wage increase in addition to the upgrade mentioned above, also effective Nov. 24. This 1.0 percent general wage increase for CCAs is in lieu of the Cost of Living Adjustments (COLAs) that career letter carriers receive in accordance with Article 9, Section 3. This entry was posted in City Carrier Business, General Union Business and tagged Article 9, general wage increase, NALC, National Association of Letter Carriers, pay schedule consolidation, steward resources, upgrade, wage increases. Bookmark the permalink. Upgrading all CC-1 carriers to CC-2 eliminates landing spots for clerks during excessing, since they cannot be excessed to a higher level. This happened before in 2000 when city carriers were upgraded one level. APWU members soon got a one level upgrade, also. If that doesn’t happen again this time, clerks will be in a world of hurt when excessed. The 50-mile limit for excessing expires with this contract!